This morning after I finished up with what I had to do at my desk, I turned around to attack the job of tidying up around the house–something that has severely suffered with our pitiful sneezing and worn out from colds selves. Why am I the only one who can fold blanket? Sigh. Why am I the only one who can fold a blanket? I rescued that one from the GW Boutique a while back. Someone handmade that quilt and didn’t quite make it full size, but it’s a great size for throwing over your lap while watching the Saturday night Britcoms or reading in this “spinny chair,” as my littles call it. I do try to keep it folded neatly though and in a different room entirely. 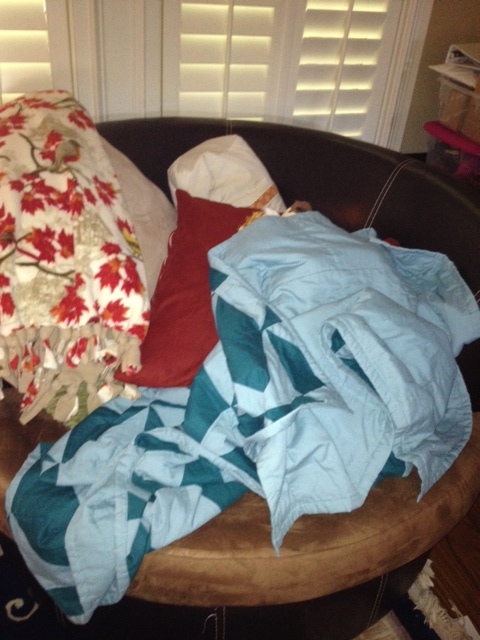 So that was my first task for the day–to fold the blanket and neaten up the chair. When I got over to the chair and started to pick up the blanket, this is what I saw. 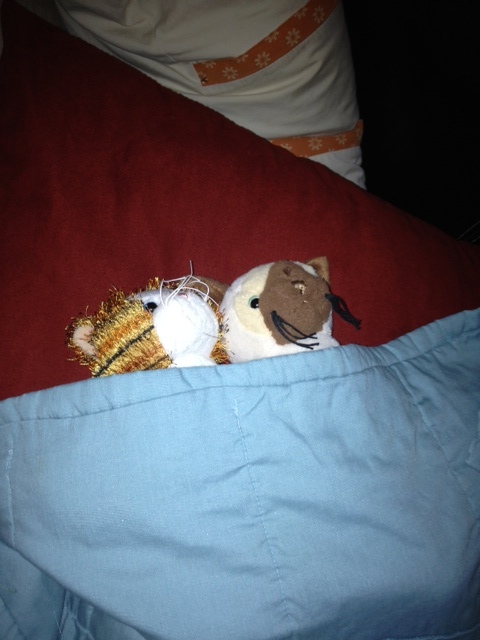 The Princess’ “pet” kitties taking a nap, tucked in snugly under the blanket–Chica and Sugar Ray Jr. Apparently our Princess had tucked in her two “babies,” as she calls them, for the night last night, and they hadn’t quite gotten up while she sat and had her breakfast at the table in the other room. This right here–it warms my heart. She is at the age (almost 9) where many girls her age are transitioning away from things like dolls and stuffed animals and catching baby frogs or “hopping Joe’s” as they call the spittle bugs. I know this for a fact. Oh maybe not all of them, but I’ve seen enough who are more interested in older things that I know my girl is atypical for her age. And I’m thankful for that. And for her sweet spirit that has her doting on these stuffed “babies.” So today instead of folding up blankets and picking up Lego creations and putting away dressup clothes, I let ’em be. They won’t always fill our house in this way, so today I decided to be thankful for messed up blankets and “modified” (his word) Lego Star Wars vehicles next to the grits on the kitchen counter. As Mama said, “There’s a time and a place for everything.” And today was the time to enjoy the “clutter” and just be. There will be time enough for cleaning it up tomorrow. I’ll let you know how it goes. In the meantime, I am thankful for two kitties who reminded me to slow down, relax, and let some things go. Even if just for the day.